Develop a loyal, profitable customer base. Create a strong network of promoters. Encourage direct booking to reduce OTA commission fees. This is not news to the hospitality industry. Hard work, attention to detail, personal service and great communication have been hallmarks of the best hotel teams for centuries. However, it is only in (relatively) recent years that the data has been easily available for analysis in sophisticated tools. This allows us to develop clear criteria for how the business values hotel guests over time and act accordingly. In this case by using a recency, frequency, monetary (RFM) model for guest retention at hotels. To demonstrate the importance of customer retention in the hotel industry, we used real-world data from one of our clients (anonymised with charts adjusted for clarity) and analysed 7 years of records, including over 65,000 bookings from more than 44,000 individuals. A matching algorithm combines any bookings that were made by the same person in order to demonstrate the monetary value of that guest. The chart is made up of thousands of columns representing the lifetime value of each individual in the dataset. Note that the scale has been limited to $15,000 for clarity but the most valuable guests (the columns on the far right of the chart) greatly exceed this figure. What’s striking is that, in our example, 13% of individuals account for 50% of lifetime value through 24% of bookings. 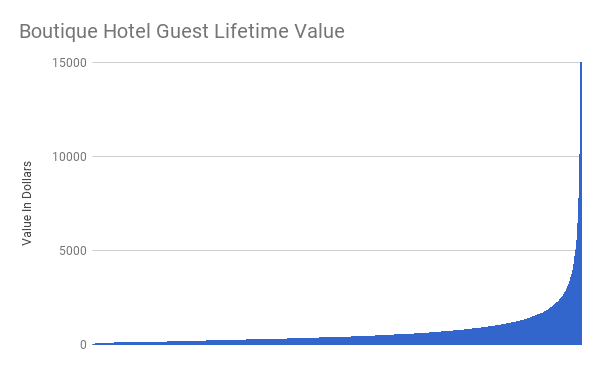 That’s right, half the room-related income for the hotel over the last 7 years and almost a quarter of the bookings in that time were from less than 6,000 guests. This clearly demonstrates the importance of guest retention at hotels but poses the additional question, what type of guest? Recency is a measure in time since the last booking by the guest. Frequency is the number of times the guest has booked in a given time period. Recency – guests with the last booking recorded over 12 months ago score 1, 6-12 months ago score 2 and under 6 months ago score 3 points. Frequency – guests with just one booking score 1, with 2-5 score 2 and 6 or more score 3 points. Monetary Value – guests with a total spend under $500 score 1, between $500-$1,500 score 2 and over $1,500 score 3. The result of this simple process is the classification of previous hotel guests into 27 different categories. Note that the aim of the interval-setting exercise is to create similarly-sized groups in each. By letting the data set the interval size, you remove some of the human bias inherent in any process we manage. 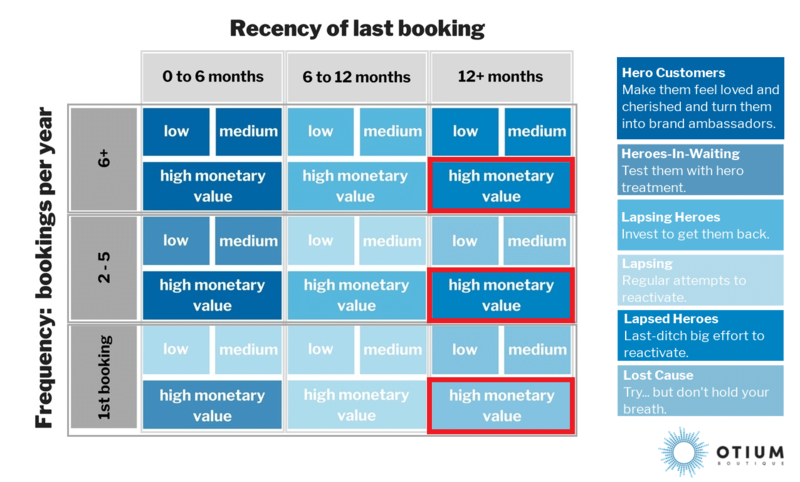 Categorizing customers by the recency, frequency and monetary value of their bookings results in 27 customer groups in our example. Using these lists, the savvy hotel marketer can build campaigns that take into account the attributes of each group. For example, a singular focus could be placed on the highest value guests (recent, frequent big spenders) and the list could be used in tools such Facebook Advertising to target these individuals with content designed to inspire an elaborate itinerary of activities and dining centred around a long stay at the hotel in one of the finest suites, pushing the average length of stay and consequent spend even longer/higher. 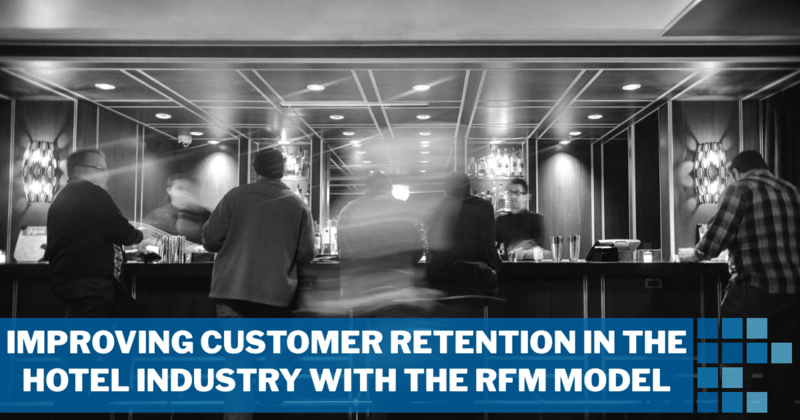 Loyalty programs are nothing new in the hotel industry, but what about taking this a step further using the RFM model as the basis for segmentation? Starting with the group that demonstrates the highest purchase frequency we can further divide according to check-in day and create a new group of frequent, mid-week guests. This group may then be used as the target audience for a ‘surprise and delight’ campaign designed to deepen brand affinity for the boutique hotel. There’s no need for an onerous loyalty program with an elaborate points scheme. Special effort can be made to try to encourage the return of high spending guests that appear to have lapsed in recent times (high monetary score, low recency score in our RFM matrix) through a campaign of handwritten postcards or downloadable destination art aimed at rekindling memories of prior trips. 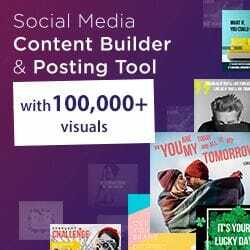 Testing may be useful here in order to demonstrate campaign value with a sample subset prior to rolling out a campaign for the entire segment. Complaints are inevitable but the response to them is not beyond our control. The RFM model can be useful in managing guest complaints because there may be significant value in going above and beyond the typical response in order to retain a particularly valuable guest. Unlike some models, the RFM model takes into account more than monetary value alone. This may be especially useful in dealing with reputation management on review websites. Some CRM’s provide a dashboard that gives some indication of these values for frontline staff to aid decision-making. In order to attract more of your best guests, it follows that your marketing should speak to their emotional triggers. With time, you can collect information from your guests that will help shape your hotel’s content marketing strategy and deliver more of the type of guests you want. By collecting information from guests through reviews or purchase habits (for example, restaurant bookings, spa treatments or excursions and activities) and categorising them according to the guest’s place in the RFM matrix, you can see patterns. Then, by cross-referencing with the keyword research done as part of your hotel SEO, you’ll see opportunities to rank well for the searches that your desired guests are making. Using the earlier example, part of the overall strategy could be to encourage previous high spending hotel visitors that have not visited recently to consider a future visit by sending a handwritten postcard with a unique offer code for tracking. In our matrix, these people are in 3 of our 27 categories. For the sake of this example, we’ll assume the total dataset is 44,000 people and that our combined target segment (not recent, variable frequency, high monetary value) is 3,000 people. Build RFM model and segment the total dataset (44,000 people into 27 categories). Combine categories by desired outcome (our 3 categories combine in this hypothetical example to 3,000 people). Take a representative sample (10%) of the group and send each one a personalized, handwritten postcard with a unique offer code. Measure the conversion rate in a given timeframe. If the profit of the conversions is greater than the costs of the test campaign then repeat for the remaining people in the group. This example is labour-intensive (handwriting 300 postcards) but appropriate to the market. If the total cost of a sent postcard is $5 and the revenue from the average conversion is $2,500 from a booking that a hotel would typically pay a 20% commission on to an OTA (a common cost of acquiring a new customer) then the campaign pays for itself at a 1% conversion rate and above. Put simply, it is typically cheaper and easier to reach an existing customer than acquire a new one. This is the principal benefit of a customer retention strategy. Whilst we have not exhausted all the different potential retention tactics in this article, we provide a simple and effective framework on which any size hotel with good booking records can base a strategy. If you seek ideas and assistance for how to reach your lapsed heroes, create effective campaigns and implement a strong customer retention strategy, let’s talk. A specialist in business development, market research and analysis with a passion for adventure. I especially enjoy working in the mountains and meeting intelligent people with thought-provoking ideas for how we can make marketing more relevant, engaging and timely.